In the big scheme of things, a person can feel so insignificant. So it was a welcome surprise to see that our government (at least I think it was ours) cares enough to research potential risks to the general public. No risk could be more significant that the impending Zombie Apocalypse. Before I get to the juicy details, I have to tell you that there is a very high creep factor to this, and I know because I've watched The Walking Dead. This true-to-life documentary follows the trials and tribulations of a band of post-apocalypse survivors. All your friends may be jerks, or at the very least, untrustworthy. Antoine Dodson may have been warning us, surreptitiously, when he said: "Hide your kids, hide your wife." Every time I look at my friends, especially Lorrie, I think "sure she's nice, and we've known each other a long time...we've been through thick and thin...but she will probably eat me." If you experience any feeling of happiness or well being, there's a good chance you are about to be eaten. It's the zombie apocalypse version of going toward the light bliss. Examples of these early warning happy-events include: feeling safe, falling in love, finding a safe camp, having a baby, making a "connection" with another human, or a surprising reappearance of someone you know from the past. Actually, that last one is a double whammy, because you have just reconnected in time to see a zombie eat that person. What are the odds? I'm working on a zombie poker face. We will lose the ability to find weapons. A stick will look like a good idea. Nothing says safety like kindling. Time after time, we will choose hand-to-hand combat over getting as far away as possible and lobbing something deadly at said zombies. It would serve mankind well if we could try to get out of this habit before the apocalyse. I plan to build a catapult in advance and I'm pricing the huge concrete barriers currently used to frame sections of freeways. If I could get a good deal on about 100 of those, I think I'd have a zombie home base. The doors on our homes that kept out burglars and kept our important stuff safe will be totally lame. The zombie burglar will just plow through them. Perhaps "dead bolt" is false advertising, or at least misleading. The stress of the anticipated apocalypse prevents me from thinking clearly on the subject, but fear not! There's good news: All the information and tips you might need on the run have been put on conveniently sized playing cards. Zombie traits, survival tips, weapons, lions and tigers and bears, oh my - all in your pocket. 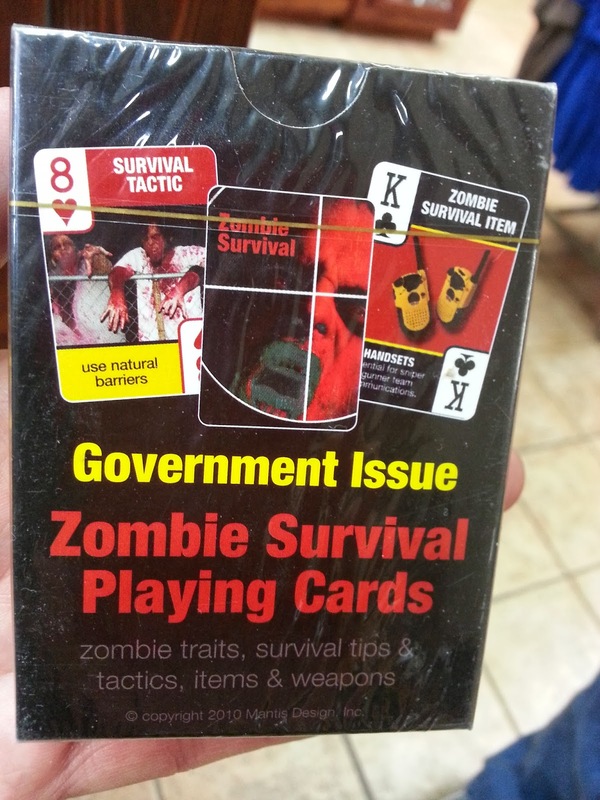 Thus far, I've not seen any casualties of zombie attack surrounded by playing cards. It gives me a warm feeling inside.